I’ve been teaching Dickens this term. I don’t find much to say about Hard Times, with its skewering of Utilitarian selfishness and ‘fact’ displacing ‘fancy’. These strong points are weakened for me by the unpleasant hatchet job on trade unionism. Dickens rightly fulminates against the oppression of the ‘Hands’ by their greedy, bullying, heartless ‘masters’, and the injustices in the social system of the time (it was finished in 1854). His depiction of a union organiser as a windbag rabble-rouser, on the other hand, leads to the distressing conclusion that the workers will be ok provided they have imaginative outlets: principally circuses. 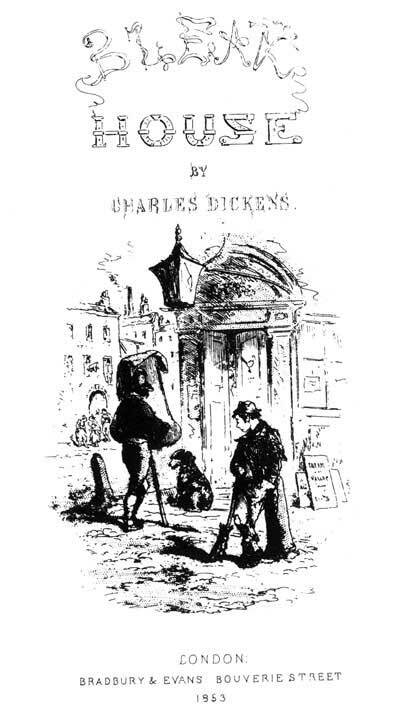 There’s too much sentimentality, too, a trait Dickens found hard to tone down. The day is closing in and the gas is lighted, but is not yet fully effective, for it is not quite dark. Mr. Snagsby standing at his shop-door looking up at the clouds sees a crow who is out late skim westward over the slice of sky belonging to Cook’s Court. The crow flies straight across Chancery Lane and Lincoln’s Inn Garden into Lincoln’s Inn Fields. Here, in a large house, formerly a house of state, lives Mr. Tulkinghorn. It is let off in sets of chambers now, and in those shrunken fragments of its greatness, lawyers lie like maggots in nuts. But its roomy staircases, passages, and antechambers still remain; and even its painted ceilings, where Allegory, in Roman helmet and celestial linen, sprawls among balustrades and pillars, flowers, clouds, and big-legged boys, and makes the head ache–as would seem to be Allegory’s object always, more or less. Here, among his many boxes labelled with transcendent names, lives Mr. Tulkinghorn, when not speechlessly at home in country-houses where the great ones of the earth are bored to death. Here he is to-day, quiet at his table. An oyster of the old school whom nobody can open. That motif of the crow recurs throughout the narrative, serving as a device to connect the contrasting locations, from the lowly law stationer in his shady, dank court, to the grand ‘house of state’ of the pompous, corrupt lawyer Tulkinghorn. In Bleak House Dickens brilliantly links the high and the low (even street crossing sweeper Jo, effectively a beggar, who ‘knows nothink’, plays a key role in the puzzle. Everyone knows something, but what they don’t know is usually more important. There are secrets everywhere. Even the painted Allegory on the ceiling signifies more than its surface reveals. That simile of the lawyers lying ‘like maggots in nuts’ is crude but it works. To move on to ‘an oyster of the old school’ mixes the image improbably, but Dickens is in such fine form here he gets away with it: Tulkinghorn, like Allegory, can be two things simultaneously – maggoty in his insidious law-scheming, and oystery in his clammed-up secret-guarding. This is a far stronger, richer novel than Hard Times: the moral outrage isn’t negated by dodgy political prejudices and myopia. He’s still not very convincing in his women characters, though.